Turmeric root has long been known for its incredible healing and health-beneficial properties. It has been known to treat symptoms ranging from stomach pain to depression. The active ingredient in turmeric, curcumin, has been known to be especially efficient at reducing inflammation and is used to treat conditions such as osteoarthritis and rheumatoid arthritis. Tests have also shown that it may be effective at preventing skin diseases, Alzheimer’s disease, stomach ulcers, high cholesterol and more. Now, what if I told you that you would be able to increase the effectiveness of turmeric’s health benefits by 2000% by adding just one extra ingredient? I expect that your first response would be skepticism, so I’m going to give you a breakdown of how to increase turmeric’s effectiveness and why it works. Read about the full health benefits of turmeric root. Yes, you read that right. Black pepper is the secret ingredient that increases turmeric’s effectiveness by 2000%. So from now on whenever you are seasoning your meals with turmeric, add a little bit of black pepper to the meal as well in order to get the multiplied benefits. These spices go well together on almost any type of food, including eggs, vegetables, soups, you can even make tea and add into smoothies. Alternatively, you may also take curcumin supplements which is a very convenient option. Choose those with “bioperine” which is an extract of piperine obtained from black pepper. It will supercharge the absorption of curcumin by up to 2000 percent. A recent study conducted by Planta Medica, one of the leading scientific journals in the field of medical plants, came to the conclusion that an alkaloid in black pepper has been found to increase the effectiveness of turmeric’s health properties by 2000%. The alkaloid that is responsible for this effect is called piperine. Although curcumin has been widely praised for it’s healthy properties, it has also been criticized in the scientific community as being hard to utilize in terms of digestion. They found that the ingredient had poor bio-availability (meaning you can’t get the full benefits of it through digestion) due to its rapid metabolism in the liver and intestinal wall. This is where black pepper, more specifically piperine, comes into play. Piperine has been proven to enhance our digestive capacity and significantly reduce our gastrointestinal food transit time. This is significant as one of the main reasons that people were not getting all of the benefits from curcumin was due to the fact that it gets metabolized too quickly for our body to reap the full benefits from the nutrients. What piperine does is to slow down the metabolic process of curcumin while at the same time enhancing our digestive capacity. This is what researchers found, that caused a 2000% increase in bio-availability of curcumin’s nutrients. So, from now on, whenever you decide to use turmeric, always remember to sprinkle some black pepper as well. How much to use? 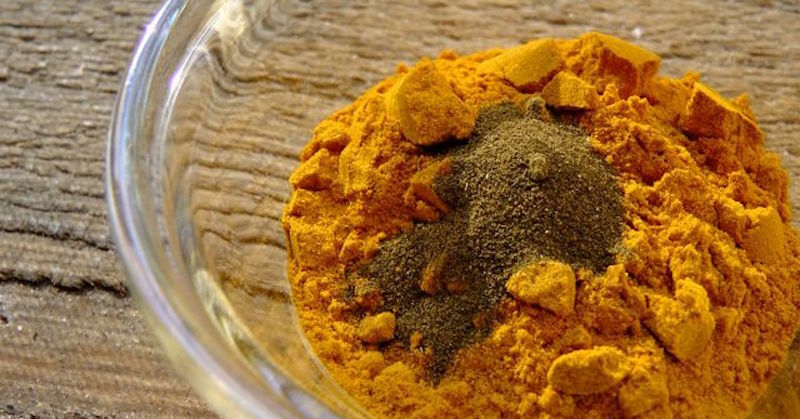 Just about 3% of the amount of turmeric powder that you’re using. It’s hardly anything but definitely effective.